Adding dog-ear cuts to your fence boards provides a more finished look. 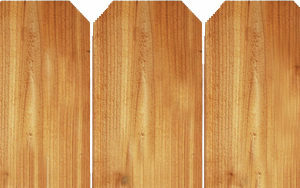 Use this inexpensive modification to add depth and character to an otherwise ordinary fence board. In order to provide maximum quality and the freshest selection; boards are not dog-eared until they are ordered. Turn-around time varies based on quantity, but can usually be completed within two hours of ordering. For added convenience, get your dog-eared fence boards delivered. Please call or visit your nearest location to receive a quote today.